Baryonyx (meaning “heavy claw”) was discovered in 1983 by amateur fossil hunter William Walker in Surrey, England. It was described by Charig and Milner in 1986. Baryonyx lived during the early Cretaceous period, from approximately 130 to 125 million years ago during the Hauterivian and Barremian stages. 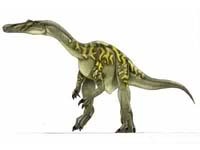 At about 8.5 m (28 ft) in length and 4 tons in weight, it was quite a large dinosaur, though the only complete skeleton found is believed to have been a sub-adult. Baryonyx forms a taxonomic subfamily with Suchomimus, Cristatusaurus, and Suchosaurus known as Baryonychinae. Remains of Baryonyx have shed light on what they–and possibly related dinosaurs such as Spinosaurus–fed up: fish scales have been found in the remains of Baryonyx stomachs, as well as bones belonging to a species of iguanodontid. 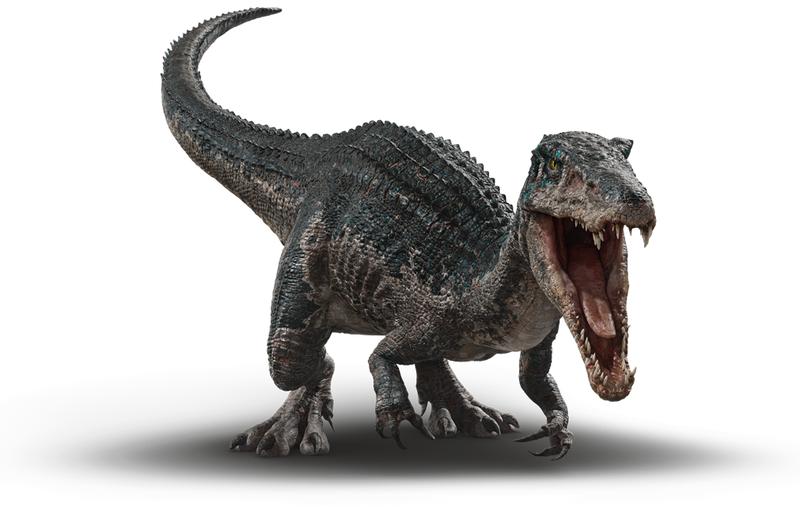 Baryonyx can be found on both Isla Nublar and Isla Sorna. 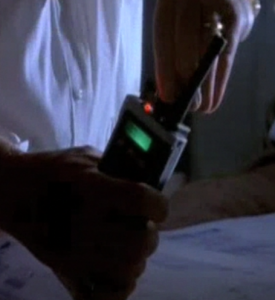 They are listed on the JP Brochure Map found in the Ford Explorer tour vehicles and on lab equipment on Isla Sorna. Baryonyx was originally slated to be the main star of Jurassic Park ///, but was eventually replaced with a larger, related species: Spinosaurus aegyptiacus. 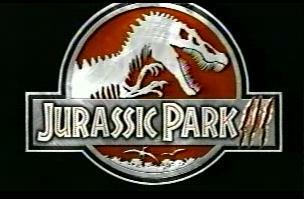 The Jurassic Park /// logo before Spinosaurus was introduced. Baryonyx is finally seen in the flesh among the pantheon of dinosaurs that are encountered by Claire Dearing, Owen Grady, and the other Dinosaur Protection Group dinosaur rescuers on Isla Nublar in 2018. A Baryonyx that had been roaming the access tunnels beneath the island was accidentally lured to one of Isla Nublar’s original maintenance bunkers on the northside of the island by Franklin Webb. Webb had been attempting to reopen the bunker doors that had locked when Ken Wheatley’s mercenaries fled the bunker. The Baryonyx came through the tunnel, and into the connecting bunker, and trapped Dearing and Webb in against a wall. After a brief tussle with the animal, which was injured by falling burning debris, Dearing and Webb are able to escape through an access ladder and hatch, with the Baryonyx snapping at their heels. The two trap the animal inside the bunker, where it presumably died in Mt. Sibo’s eruption. It is revealed that Wheatley was able to capture a second Baryonyx and was able to load it onto the transport ship Arcadia before the volcanic island erupted. This individual was subsequently auctioned off at Lockwood Manor.